Eliminate backlash damage to keyways from heavy loads. The U.S. Tsubaki POwer-lock fits tightly around the shaft/hub and is not affected by load reversals. End your high machining expenses for long shaft keyways, splined shafts, threads, grooves and steps the U.S. Tsubaki Power-lock offers exacting, slip-free location. Erase the headaches of shrink and press fits. The U.S. Tsubaki Power-lock simplifies installation and removal. This easy-to-install unit slides into position and offers a keyless shaft-hub lock that will simultaneously handle both high torque and thrust while increasing your shaft strength. The Power-lock is easy to assemble you only need one tool. It is ideal for locking in large or small sprockets, gears, pulleys, timing cams and rollers. Best of all, the Power-lock is in stock for immediate shipment. We are among the trusted names in industry, indulged in supplying, trading and distributing an extensive range of Power Locks. 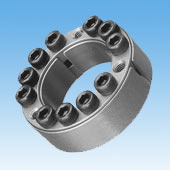 With split inner rings, solid outer rings, ball and cage assemblies, and poly amide or bras cages, these bearings are available at leading prices. 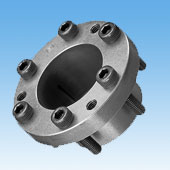 Suitable for small hub applications with the small inner-to-outer diameter ratio Standard Electrolytes Nickel-Plated. The Power Locks are used to enhance the performance of precision products. Moreover, these are also available in market in customized dimensions and other specifications. Most popular multipurpose type Standard (Inch sizes available) Electrolytes Nickel-Plated Stainless. Outer Diameter: 4", 5", 6", 7"
Tsubaki Power Locks that we provide to our clients are manufactured using high quality materials which gives longer life and higher durability. 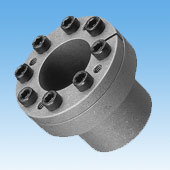 EL Series built-in pressure flange type Standard. These Power Locks are shaped like a flanges. We are suppliers and dealers of Tsubaki Power Locks which are manufactured as per industry standard. Quick connection with a single nut Standard (Surface-treated). 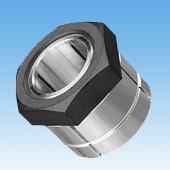 These Power Locks have a quick connection with the standard nut which is surface treated. Looking for Tsubaki Power Locks ?